Welcome to May’s edition of Banned Books. 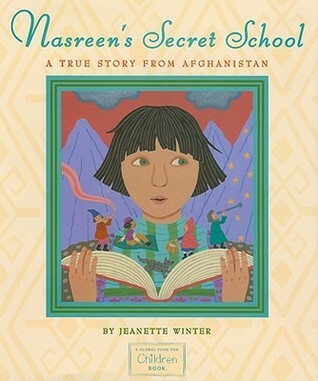 This month we read Nasreen’s Secret School by Jeanette Winter. BETH: This book was published about eight years ago now and I don’t think attitudes have changed that much in the past eight years so my thoughts on the book being challenged “then and now” are going to be the same. Unfortunately due to a number of terrorist attacks in the past fifteen years, religion has become one of those really tricky areas that some individuals tend to blame and rail against when these atrocities occur. Of course nowadays, it’s the terrors of ISIS but I remember so clearly when we used to be talking about the Taliban and their ideals. I did a little bit of background research on why this book was challenged/banned, especially in the USA and one opinion I came across (not entirely sure of its validity) is that Nasreen’s Secret School is a book which promotes Islam and that should be a reason for banning it. Never mind the truth behind this, these sorts of things just make my blood boil. Why should any book be banned for educating us all a bit about a particular religion? Personally, I find it interesting to learn about a different culture and belief system but hey…maybe that’s just me? CHRISSI: It actually makes me cross that this book is challenged. It’s a children’s book! I’m pretty sure my face was of utter confusion when I finished this book. I always try and keep in my mind that I’m reading it for this challenge, so I can look out for things that might make it a challenged book. I couldn’t find any. It’s not explicitly violent. It does include a girl going to school in secret, but I thought it had such a sweet message. It was a message about the power of education and I really didn’t agree with the reasons for it being challenged. It was pretty inoffensive to me. It really was. BETH: Let’s go into a couple of the other reasons for challenging/banning this book. Unsuited to age group. *silently seethes. * This is a PICTURE book recommended for children of six years and older and the illustrations and words are such that it can easily be understood and enjoyed by children of this age group in my opinion. As with the last reason – “violence,” I believe some people may be concerned that the Taliban taking Nasreen’s father away and then her mother also disappearing might be too brutal for some kids to take. Don’t get me wrong, that’s absolutely horrific, of course. BUT. The story is written and drawn in such a way, as I said, that it is never made explicit what exactly happens to Nasreen’s mother and father, the young reader is almost shielded from the reality of what has happened so I cannot see how this can be offensive. It is upsetting, Nasreen stops talking for quite a while and she is very distressed. Yet with the help of her courageous grandmother and by making a friend at the secret school she finally learns to be happy again and yes, to speak as well. CHRISSI: I get that Nasreen lost her mother and to not very nice circumstances, but surely that’s what we infer as adults? Would children get that from reading a picture book? I’m not sure. It certainly doesn’t explicitly tell the reader why. It just shows Nasreen’s obvious distress. Many children would be distressed if they lost their family under any circumstances, so I don’t see why this book was any different. BETH: As this is a picture book, I read it so quickly. The illustrations are simple but effective but it was the words that affected me more than anything. I fell in love with Nasreen, her grandmother and the bravery of the people that were risking their lives to educate girls once it had been forbidden by the Taliban regime. In just a few pages I felt like I learned so much and I think it’s a really important read for children so that they can be educated about how lucky they are to have free schooling, sadly a privilege not everyone is entitled to and something people should definitely be made more aware of. CHRISSI: I thought it was incredibly adorable. I thought the characters were brilliant and the story was well told. The illustrations were simple and sweet. It’s an important and educative story, in my opinion! « A Week In The Life Of A Primary School Teacher- The Great Outdoors!